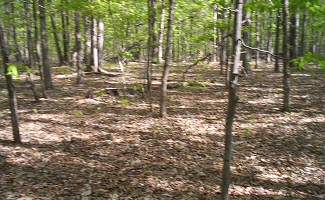 Section of woods on the Wilderness Battlefield near where General Longstreet was injured. Thickness of the woods in 1864 was much denser than shown in current photo today. Photo above: Union soldiers filling their canteens during the Wilderness campaign. Photo courtesy Library of Congress. 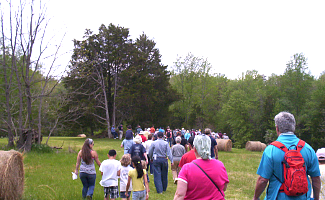 Above Image: 150th Anniversary Ranger Walk on the Wilderness battlefield. May 5-6, 2014 - It would be the beginning, here three years into the great Civil War, of a change. A change in commanders by the Federals to U.S. Grant after many attempts to get a Union one that could match, in some way, the determination of Robert E. Lee for the South. At the Wilderness, this was the first time they would face off against each other. And with that, a tactic, a change of tactic, in the eastern theater of the war would eventually lead to a conclusion of the war a year later. What was that change of tactic? Find the enemy, fight the enemy where he was, pursue him, and force attrition in manpower and supplies to force a surrender. The stories told at the 150th Anniversary of the Battle of the Wilderness begin to tell that tale. When the opening salvos of the battle rang across the corn stubble of Saunders Field across the Orange Turnpike (today's Route 20), it was in an area where the enemy had been found, but not the most adventageous to an army with an advantage in numbers. As the reenactors and spectators trudged up and down that first spark of battle, and spark would play a big part as the battle raged on for two days, through the muddy ravine and to the edge of the woods, they would learn the details of that story, a story that should wield a heavy mallet in the reason why the end of war would come. 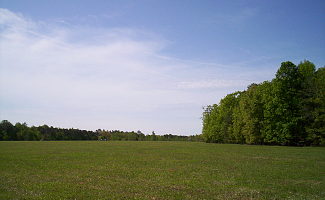 The battleground at the Battle of the Wilderness, part of Fredericksburg and Spotsylvania National Military Park for those less initiated, is in some way a hard place to interpret. Those thick woods, much thicker in 1864 than even today, the long winding path of the park roads without many view vistas that enable a visitor to see scope, to understand direction and movement, make that difficult. But this is the reason why celebrations like the 150th occur, as the Park Service does its magnificent jog, through battle walks and talks, to help bring all those into focus. And boy, did they do that, bringing it all to life again, and all without a spark that would set the woods ablaze, with the modest exception of a campfire or two at an evening talk, which is one of those rare treats if you get the chance to visit any of these places, you should take advantage of. May 5-6, 2014 - It's hard to put into numbers the amount of spectactors who visited the anniversary. It's hard to see one hundred yards in front of you through the woods here, let alone count. The battle walks were well attended, I'd venture a guess of 1,000 or so at the opening Saunders Field real time event, one of the few with a vista. Soldiers at the Wilderness - There were approximately 120,000 Union soldiers and 60,000 Confederate soldiers engaged in the Battle of the Wilderness from May 5 to 6, 1864. 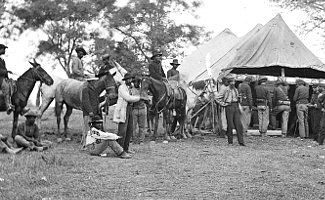 Below photo is of a group of Union soldiers filling their canteens during the Wilderness campaign. Photo courtesy Library of Congress. 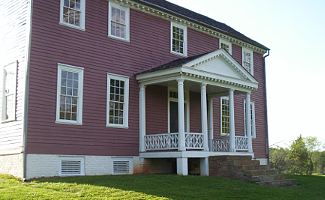 Ellwood (Lacy) House - The Ellwood Mansion was the headquarters of the Union Army, particularly General Warren and General Burnside, during the battle. Today the house has been restored and both the house and grounds are open for visiting daily. It was the location of the evening program detailing the last calm night, May 4, before the battle. The Ellwood house, then owned by the Lacy family, was part of a five thousand acre plantation, which had one hundred and seven slaves. Widow Tapp Field and Farm - One of the few open spaces at the Wilderness Battlefield is the home of the Widow Tapp (photo below), who was eeking out a meager existence prior to the Civil War when suddenly onto her farm rode General Robert E. Lee. This was one of the last battlegrounds of the fight here, so desperate was Lee to stem a losing tide that he tried to lead his men personally into battle from the front. His men thought better of that and the call "Lee to the Rear" was heard. 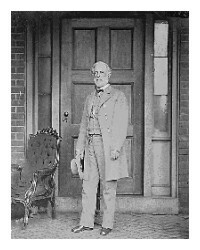 Lee would have another "Lee to the Rear" moment one week later at Spotsylvania. The Actual Wilderness - Just one example of the forest in the Wilderness today. Although deep and surrounding, today's forest is much less imposing than in 1864. During the battle, it was shorter with more brush and brambles due to an overuse of the area for tobacco and logging in the past which would devastate the land. The growth there would have been a decade of so old, ten to twenty feet high, and packed much tighter than what the photo indicates. 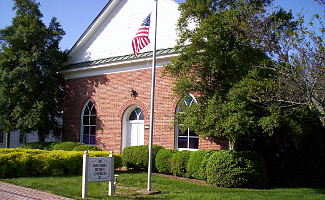 Spotsylvania Court House - Not a courthouse, but a church (see photo below), this is one of the period buildings you can visit on a walking tour of the town of Spotsylvania Court House, which is located only a couple miles from both the Wilderness and Spotsylvania battlefields down the Brock Road. 1. A Fight in the Road. I don't now why this stood out for us, but it did. On two separate occasions, at a battle talk and later battle walk, the Wildernss Park Ranger discussed a unique story that happened during the opening Saunders Field fight. After the Union Army had been pushed back off the hilltop a bit, with many soldiers traipsing through a ravine, two soldiers, one Confederate and one Union hid under the lip of the sod, eventually noticing each other. But that created a dilemma. Who was the prisoner of whom? They decided that they would have a fist fight to determine and the winner would capture the other. So they came out from the ravine and stepped into the middle of the road and fought. The other soldiers in mid shooting fight saw this, and stopped the battle while the other fight, between two men, raged on the turnpike. Once a winner had been determined, and prisoner caught, the rest of the Union and Confederate soldiers returned to shooting at each other. These are the stories you just need to hear at the exact spot where they occurred. Fantastic! 2. The Battle Walks. Throughout the park, predominantly arranged along the main Hill-Ewell Drive that snakes through it, interpreters would take small groups, sometimes even yourself, on a detailed discussion of that place and time. These were not the large battle walks with real time consequences, but great overviews of the area. It made the context of the battle become more organized in your thoughts. Later, during the May 5-6 timeframe, the large two hour walks occurred with detailed analysis of regiments and brigades and the wheres and hows of the battle. 3. Campfire talk at Ellwood. On the even of battle, the head park historian, John Hennessey, regailed the audience with an hour talk about what was occuring the night before the battle began, as well as what it would mean to the war effort. We've mentioned this above, but want to emphasis this point. If you ever get the chance to do an evening Park Service program, take advantage of it. It provides a nice coda to the day, is often less taxing from a walking standpoint, and a relaxing way to understand where you are and what it felt like when the sun begins to go down. Thought it was odd you couldn't drive to this one and had to take a shuttle, but ... hey, small point in a much grander picture. 4. Into the Woods - One battle walk seems to stand out to us and perhaps that's because, for the most part, success here was determined by the terrain and elements and that terrain was trees. In 1864, it was a second growth forest, mostly brambles, thickets and trees ten to twenty feet high. You could not see forty feet in front of you. Try to get a battle line through there, almost impossible. During the Longstreet area walk (pictured above with head park ranger and historian John Hennessey), you could really get the sense of that impediment. Two groups would set out into the forest with a ranger; once the first group got fifty yards ahead of you, you could barely see them. Imagine that in the fog of war, and in this battle, the fog of war included a gunpowder spark that set the surrounding forest aflame. May 3, 2014 - Check out some videos from the National Park Service about the actions at the Battle of the Wilderness. The fields of the Widow Tapp farm, Wilderness Battlefield. Even if you missed the special events of the 150th anniversary during the first days of May 2014, you can still create your own. 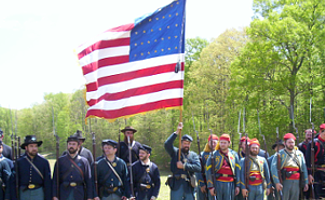 The Wilderness and Spotsylvania sections of Fredericksburg and Spotsylvania National Military Park is there for the taking year round. They are in remote areas of the park itself and neither have a visitor center (there is one at Chancellorville about five miles away). Both have exhibit shelters that are staffed on weekends. You can wander around them at your pleasure, but I'd suggest stopping at the Chancellorsville Visitor Center and finding out when a battle walk was scheduled. At the present time, both sections have guided tours on weekends. That'll help fill in a bunch of the gaps you have when you go there. Ellwood Manor, which served as a Union headerquarters is open daily starting April 28 for the summer season; there are weekend guided tours. 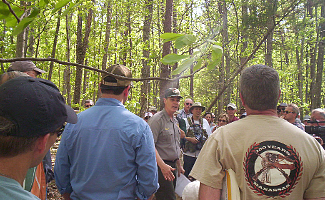 Photo above: Head park historian John Hennessey giving talk in the woods where General Longstreet was injuired during the 150th anniversary. Photo above: Ellwood Mansion, headquarters of Union Army during the battle. Site of evening campfire talk during 150th Anniversary celebrations.